It is no secret that China accounts for a major share of both total international enrolment and enrolment growth for major study destinations around the world. In the US, students from China account for nearly a third of all foreign enrolments. Chinese students also drove roughly 57% of overall foreign enrolment growth in the US over the past decade. The numbers are similar in the UK where Chinese students account for three of every ten foreign students in the country, and again where Chinese enrolment growth has outpaced overall growth for some years. The situation is the same in Canada and Australia, but also in a number of non-English-speaking destinations, such as South Korea and Taiwan, which rely disproportionately on Chinese students to maintain or build their international programmes. These destinations have come to count on China as the world’s leading outbound market, and not just to occupy a large proportion of seats in campuses and classrooms but also to help meet enrolment targets with brisk year-over-year growth. The problem with this is obvious and has been ringing in the ears of many international educators for some years now: what happens if Chinese outbound growth slows down? Indeed, there is some indication that this is starting to happen. Over the last two years, annual outbound growth, while still strong, has fallen notably below the levels we have seen for decades. Average annual growth has been about 19% going back many years, but that long-term trend began to level off around 2013. Between then and 2015, year-over-year growth has slowed to 11-13% annually. At current outbound levels, this slowing growth rate has been hardly noticeable so far and China remains a major driver of overall enrolment levels in both established and emerging study destinations. But the point here is that many institutions and schools have come to rely on that underlying, consistent growth out of China to hit their annual enrolment targets. And if China slows down any more, some recruiters are going to find those goals harder to make. We recently looked at the case of Chinese enrolment in US high schools and there again we see a distinct levelling off enrolment growth from about 2013 on. At the same time, the number of US secondary schools recruiting foreign students has increased considerably. The result is a larger field of schools recruiting a shrinking pool of students, and a more intense competitive context for all. The specific case of secondary recruitment in the US takes on greater significance when we consider the long-term demographic forecast for China. A recent report from Universities UK highlights the projected numbers of college-aged students in China and other major sending markets through 2025. 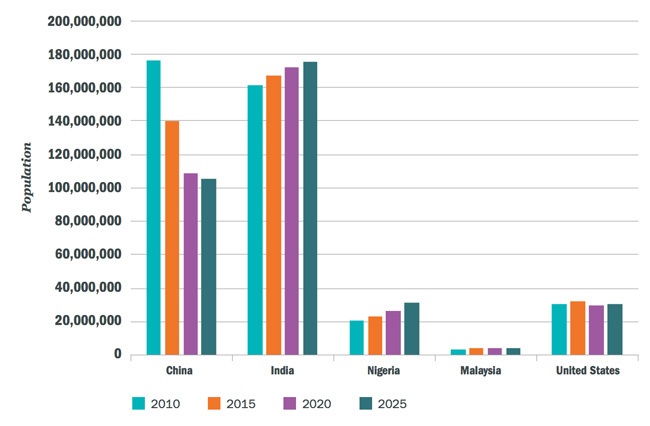 As the following chart illustrates, the trend line in China is markedly different from other key source markets, such as India or Nigeria. The college-aged population in China – that is, the 18-to-24-year-old group – is projected to decrease by more than 40%, from 176 million to 105 million, between 2010 and 2025. On a brighter note, the chart also highlights continued growth in this key college-aged cohort in other major growth markets, especially in India. Along with China, India has been the primary driver of overall enrolment growth in many study destinations and has certainly come to play a greater role in driving global mobility trends within the past decade. Even so, the implications for recruiters is clear: competition for Chinese students is likely to intensify going forward and many programmes will have to more actively build student numbers outside of China in order to continue to hit their enrolment targets. This entry was posted in Asia, China, Higher Education, Regions and tagged undergraduate student recruitment, student enrolment, universities with international students, Chinese universities, tertiary education overseas.